I don't know about you but I for one have been enjoying this recent wave of Diggin' In The Crates related releases coming out over the last several months. 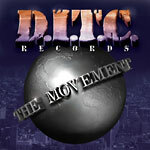 Some have been unearthed collections of rare and unreleased joints, others are a shot at reviving some familiar names, and one release even compiled breaks and beats used to construct some classic DITC productions. AG and OC lead the way on The Movement with a few core members missing but still featuring production from Showbiz, Lord Finesse and Buckwild alongside newer additions to the crew including D Flow, Party Arty, Boss Money, and A. Bless!